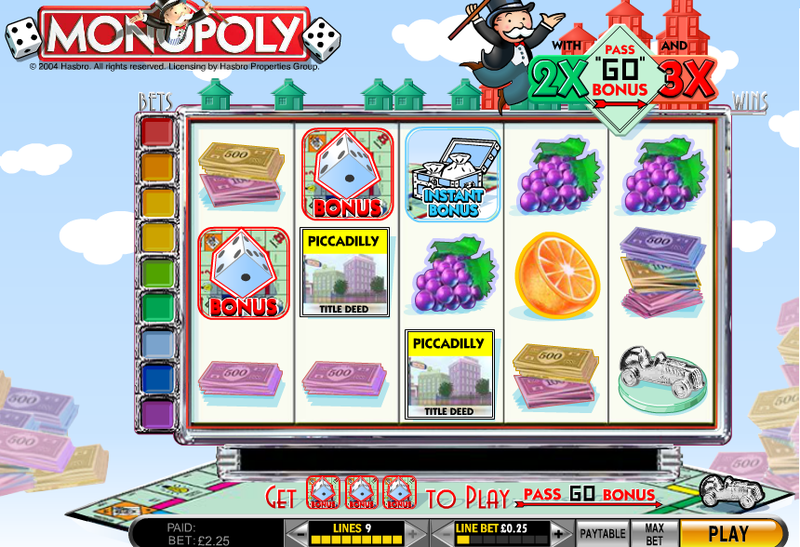 Undoubtedly, the worlds most famous board game has now hit the online fruit machine world. The Monopoly fruit machine game is a multi-line, multi-coin slot game that offers players the chance to win big, with a total of 9 paylines. Monopoly slots has two bonuses that are the Community Chest Instant bonus and the Pass “GO” bonus. Found on the Playtech network, this online fruit machine offers players 9 ways to win with a RTP of 96%. The games graphics mimic that of the board game, and have several familiar pictures representing the scatter, bonus and wild symbols. The games sounds only come into play when players press to spin or when they win a cash prize or during a bonus. After unlocking one of the two bonuses, the music really starts to pick up and transforms you into another dimension, it’s simply awesome. The minimum bet is £0.25 with a maximum bet of £45 if you choose to play all 9 lines. The Monopoly Wild is the wild symbol, and can be substituted for everything expect the Bonus Dice or the Instant Bonus symbol. Community Chest Instant Bonus – players unlock this bonus by getting 3 or more Instant Bonus symbols to appear on the screen. The player then has to click one of the Instant Bonus symbols to reveal their bonus multiplier, these can be as high as x20. Pass “GO” Bonus – is unlocked when a player manages to obtain three or more Bonus Dice symbols on a payline. Once the bonus is activated, the player selects one of the Bonus Dice symbols to see how many roles they get in the bonus round. Next they will be transported to the Monopoly board game where they roll the dice and move along the board collecting bonuses. Depending on where you land on the board, affects how much money you can win. For fans of the old school board game, we think this online fruit machine will win over fans immediately. The graphics draw you back to your younger days and bring up old memories of the game we once loved as children. The music is okay but becomes totally awesome when you get the Pass “GO” Bonus, and you here all sorts of crazy sounds that enhances the gaming experience. Monopoly slots can be played at William Hill and Paddy Power. For a review of all the best fruit machine games, visit our homepage.